​Ready to jump in and join us? Dan's article in Communities Magazine about what he is learning by living with the other RareBirds! 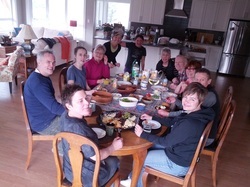 Living Together is a hosted café about housing models. Together, we will learn and share about alternative living options emerging in the world. Perhaps you are curious about what is occurring with respect to affordable and sustainable living arrangements. Perhaps you have a project in mind and would value an opportunity to share about it. Perhaps you are sensing a desire to more fully live out your ecological and social values. The members of the RareBirds community will share from our co-living experience as an equity co-op (5 years plus and counting!). We will also include other models into the mix of conversation: land trusts, public housing, baugruppen, co-housing, micro-houses, eco-villages, work trade and other experiments. A story about our project on Shaw Cable. March 29 2014 yard work day... we had 20 people show up at various times (and some stayed all day) to help us with the landscaping of the backyard. It was an on-fashioned work bee! Feb. 22 2014 and we are beginning to move into the completed birdhouse! We have lots of landscaping work in the months ahead (we will be organizing big gardening parties!) 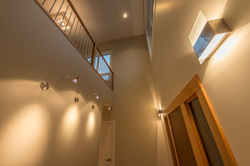 Look for more interior photos of our house in the gallery page under HOME. November 25, 2013 update: the stucco work continues under tarp but we lucked out with another reasonably warm week of weather coming up! The drywall is being completed this week... and the finishing crew will be starting soon with windows and priming the walls upstairs first. 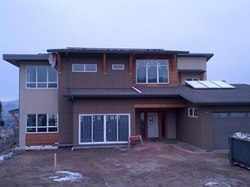 October 30 2013 update: some of the stucco is complete on the back of the house and the crews are working forward with exterior insulation on both sides towards the front.. the weather has been great so far! The interior is being insulated after the rough-in of electrical and plumbing and heating... it is going well! Windows are in and doors next! 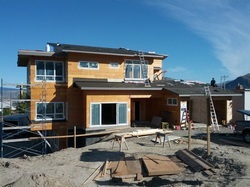 October 2013 update: the roof is on and the stucco crew is starting this week. Doors are going in along with the soffits. The electrical and plumbing are underway! 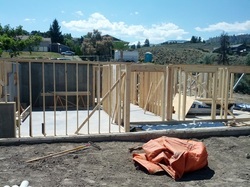 Construction in August: Framing and Roof! We are framed up to the start of the second floor in early August 2013. Contact us for more information about getting on our contact list! Basement and first floor framing is underway in mid-July. We have our underground and concrete work mostly complete now!! 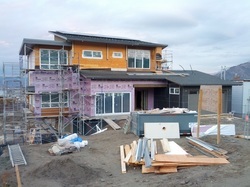 It is starting to look like the amazing new house that it will become! Our Public Hearing date on the Zoning application is now scheduled for March 26th. We have been busy connecting with our neighbours, keeping them informed of the proceedings and being available for any questions or concerns they might have. We are happy to explain our living concept to anyone in the community curious or concerned. Feel free on contact us. On February 14th the City Planning Department completed their report on our Zoning application. It was forwarded to City Council on Feb. 19th where it was approved for Public Hearing. One last step on the road to serious nesting. SHOVEL IN THE GROUND SOON! We are currently in technical review with the City Planning Department for a site specific variance of the property and anticipate finalization of this process in February 2013. 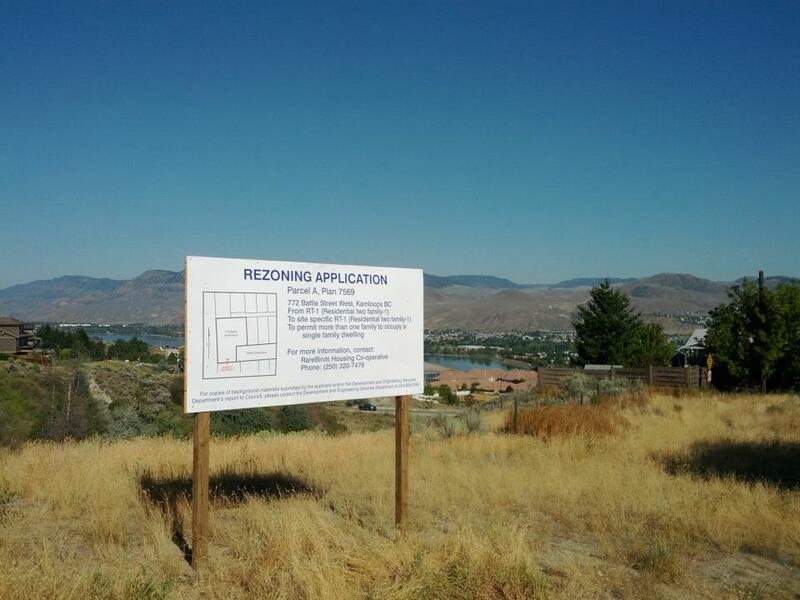 The lovely view from our property on West Battle Street, Kamloops! We have exciting news to share! After a year of searching and many discussions about location and deliberations about building vs. renovating we have settled on an amazing lot at the end of West Battle on the Guerin Creek Ridge. Imagine finding a flat lot that has never been built upon within walking distance of downtown. We are truly blessed. This spring/summer we can hear the rush of the creek and smell the sage on hot afternoons. We have a panoramic view of the Thompson River, West and North and will no doubt see some stellar sunsets. Last Saturday, July 14th, we had a meet the neighbour’s party on the lot, answering questions and concerns. “What’s a RareBird anyway, and what on earth are you going to build? ”Our new neighbours, much like many of our friends think this is such an amazing and wonderful idea, but just a bit too gutsy. We continue our search for another gutsy Bird or Birds (couple or single) to join us in this venture. Now is the time, as we will now be moving into designing our home and all the details and decisions that entails.We hope our 6th investor will be part of this next phase. We will spend time on this phase as it is so vital to the community we are creating. We expect to be building in earnest next spring and ready to harvest some lettuce and tomatoes this time next year. So if you, or anyone you know is drawn to take a leap of faith in leading the way in building more sustainable and practical ways of housing ourselves at a stage of life when “the big house” is way more than a couple of people need to rattle around in, please contact us. We would love to explore possibilities with you.